Gotham Steel XL Reviews - Too Good to be True? Gotham Steel pans are all non-stick in their design, made from a combination of titanium and ceramic. They can, allegedly, never be scratched and food will slide right off them without needing any extra oil or butter. The pan is allegedly heat proof up to 500 degrees. Said pan is free from PTFE, PFOA, and PFOS. 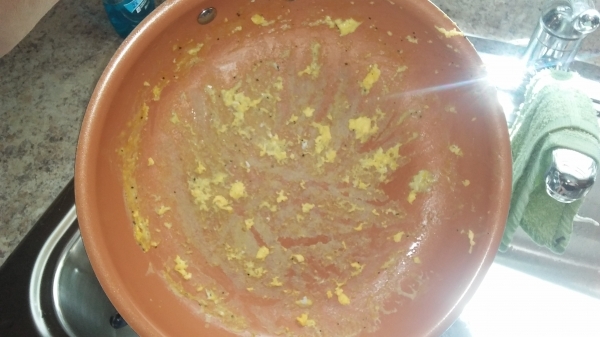 Melted cheeses will not stick to this pan. In fact, once you let the foods melt and stick, they lift right off of the hard surface. The cost of Gotham Steel XL is $59.97 and the shipping is FREE! Dishwasher safe so clean up is a breeze, even if something does end up sticking to it. Oven safe up to 500 degrees which means you can cook high heat recipes without issue. You can use metal utensils inside without issue. No longer do you have to scrape or scratch at the surface because things come off easily. They are free from unwanted byproducts of other nonstick pan designs like PFOA, PFOS, and PTFE. This one pan will theoretically replace all of your other pans given its 25% larger capacity. The ti-cerama surface is a special design which combined slick ceramic with strong titanium. You can cook a whole turkey in here, or dozens of stuffed peppers all at once thanks to its larger size. Gotham Steel pans are pitched by a television chef by the name of Daniel Green who claims that using them is like cooking on air. He also claims that baking s’mores and cheese onto the surface will not cause any damage. You can cook things like fried foods with a special wire basket nestled inside of the pan. Alternatively, you can steam food, make desserts, create family size pot pies, and more. With the larger fry basket and the steamer you have many more options at your disposal. There is no stay cool handle like alternative designs have so you have to make sure you wear an oven mitt when you use it. Ceramic coated pans are a nice alternative to Teflon pans because you can scratch at them without issue. Each of the features boasted about by the company are legitimate. The pan will work as advertised. However, the issue is that it might not last long term. So, you might be better off investing in something that costs a bit more but will last much longer. Use a gentle abrasive like Bon Ami which will not damage the inside when you clean it. Avoid using butter or oil in the pan because this can actually shorten the lifespan of it. While you certainly can take advantage of the dishwasher safe ability, it is better if you wash the pan with water or white vinegar when it is still warm, then wipe it clean. Wipe it before anything has had a chance to set. For more challenging burned foods, you can fill the bottom with water, leave it on heat, and then scrap away at the food. Red Copper is another ceramic coated pan that gets its heat resistance from its copper infused design. Other than this it has the same features as the Gotham steel design. CorVex is a ceramic coated pan that only costs a bit more than this one. It is about the same size, has a lid, a lifetime warranty, rubber handle that is heat proof, and can withstand up to 900 degrees. Do not buy Gotham Steel XL online before searching Amazon. Why do eggs and bacon stick when ever I use it? I have two Gotham pans, small and large round pan. The large was a Christmas gift. Totally disappointed with both of them. You cannot cook a soft egg even putting butter or oil in the pan the eggs stick to it. What a ripeoff this product is. I will let everyone I know what a waste of money these pans are.